so it was a real honor to be asked to join them for a bit! cut-out onto the back of the yellow paper and traced the design and cut out. “hello” was applied just above the purple strip. 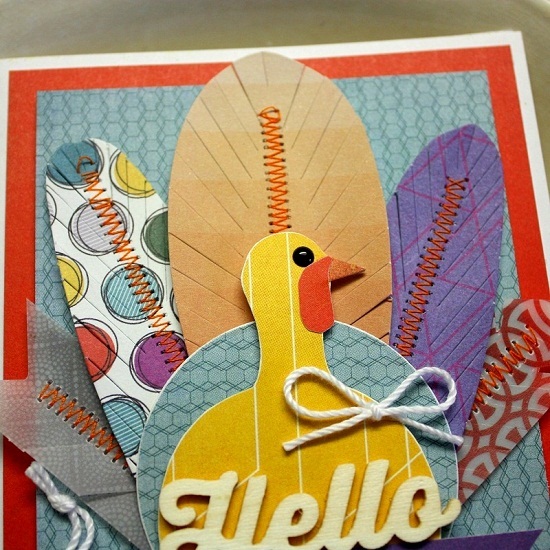 For this card I chose to arrange the feathers in a circle shape to resemble a wreath. it onto a piece of the yellow paper. To attach the vellum feathers I used Glue Dots. I separated all of the cuts to each feather to add more dimension. were accented with black enamel dots and a few wooden veneers. Glad you've stopped in to visit! THANK YOU! Congrats on the Basic Grey spot!! Wtg! 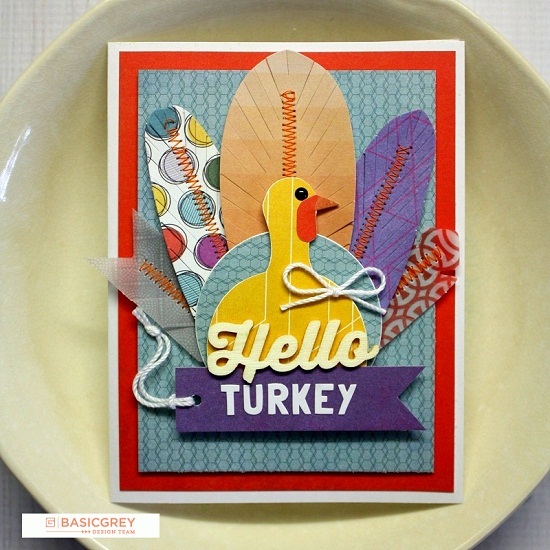 I adore the turkey card!! Love the stitched feathers! I am so thrilled for you and this new spot for you!! These cards are uber fun and uber cool!! You rocked that turkey - he is just so fun! And the you are cool card is so clever how you put the feathers in a circle! So well done and you are uber cool! !